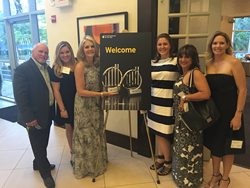 Michelle Fee, CEO of Cruise Planners, an American Express Travel Representative, (Center) is recognized as a finalist for the EY Entrepreneur Of The Year® 2016 Award in Florida on May 25, 2016. “My greatest accomplishment is when I help other people succeed,” said Michelle Fee, CEO and co-founder of Cruise Planners, an American Express Travel Representative. This week, EY honored Michelle Fee, CEO and co-founder of Cruise Planners, an American Express Travel Representative, as a finalist for the EY Entrepreneur Of The Year® 2016 Award in South Florida. The awards program, which is celebrating its 30th year, recognizes entrepreneurs who demonstrate excellence and extraordinary success in such areas as innovation, financial performance and personal commitment to their businesses and communities. Cruise Planners’ business model is unique since Fee is not the only entrepreneur impacted. In fact, the network has more than 1,400 franchises across the U.S. and each one is a small business, so the impact of entrepreneurship is much greater. Now in its 30th year, the EY Entrepreneur of the Year program has expanded to recognize business leaders throughout the world and Florida’s award winners will be announced at a special gala on June 9, 2016, in Tampa, Florida.